Not only developing the strategy but also developing the infrastructure and motivating clients to the growth are indispensable for the improvement of the clients’ performance. In other words, the combination of the strategic measures with the reformation of the corporate system and culture brings the impactful accomplishment. 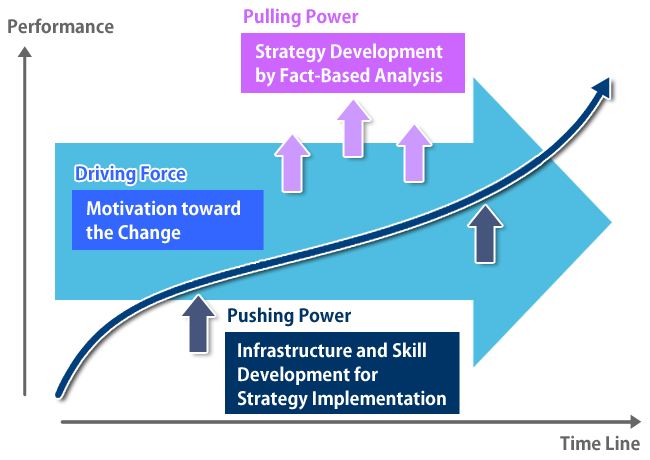 Therefore, we think the strategy, infrastructure, and the motivation are three major elements to drive the corporate change. We call these three elements pulling power, pushing power, and driving force. “Strategy” for the improvement of the performance is the “approach which leads the continuous advantage over the competitors.” To strengthen the competitiveness continuously, it is crucial to lead the impactful solution from the understanding of the company’s critical issues. To develop such solution, we conduct the fact-based analysis of the market, customer, competitors, and the client, which define what should be done as a logical conclusion. Conventional organizational structure, personnel system, company’s practice, or corporate culture quite often disturbs the attempt to change the company. When the strategic approach for the change management starts, it is important to achieve the drastic elimination of the disincentive. Leading the infrastructure (such as organizational control, personnel system, and information system) to the rightful situation is required for the smooth fulfillment of the measures. It is the “members in the company”, not the consultant outside of the company, who are in charge of the change management. The attempt for the change never fruit if each person does not have the motivation to make change. For the “real” achievement, it is essential to unite the corporate members together and to place the change management as the company-wide challenge. Our consulting not only offers strategic solution but also encourage personal motivation involving people in the change and creating the base to pursue the goal together.